Creeper Griefer! Starting to look at a Minecraft chess set and noticed that most models have a 3D printed look instead of a Minecraft look. So, started playing with using 3D depth as a replacement for color textures and whoa! Looks even better in person, or as my son said “that is sooooooo cool”. The basics of creating a model from Minecraft is so easy, it’s within my capabilities. Just a few cubes, so I put the basic model together in SketchUp. However, most of these models have no character or depth to them. 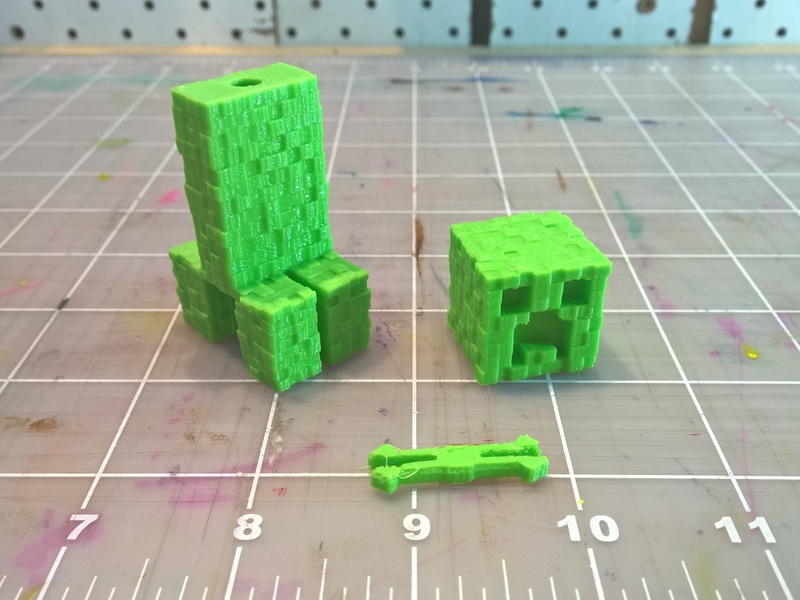 As the creeper has a randomly mottled ‘skin’, I thought I’d try reproducing the multiple colors of green in Minecraft with various depths. I subdivided all the surfaces until they were the rights size and then wrote a small Ruby script that runs in SketchUp that would randomly extrude each of these surfaces between -1 and 1 millimeters. This was the stunning result. I’ve tried the same offset trick with other Minecraft characters and it just didn’t work out, so I stopped with this Creeper. After posting, this has definitely turned into my most popular Thingiverse model with >1000 likes and collections and 58 pictures of people’s makes with their comments online. What a great community Thingiverse has.